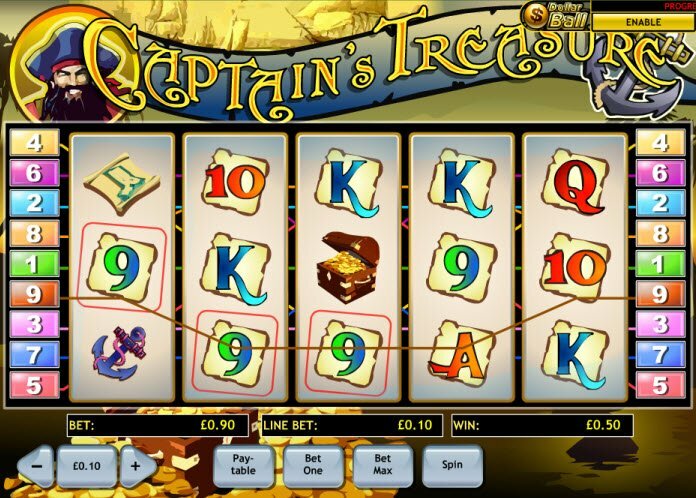 Step aboard the pirate ship and play The Captain’s Treasure Slot Machine. The slot contains 5 reels and 9 paylines. At first glance the Captain’s Treasure Slot may seem too rudimentary in terms of features and graphics. While this may be the case, the game does also offer a 5000 coin jackpot and 2500 coin payout. Get swept away on an adventure with buccaneers and buried treasures. 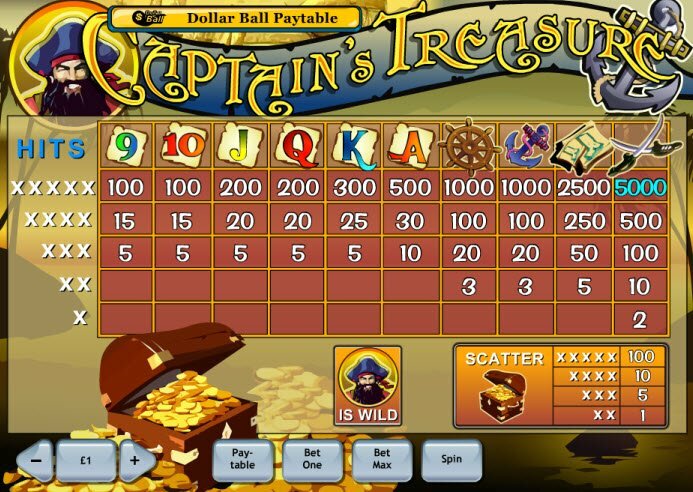 Powered by the Playtech software platform, the Captains Treasure Slot features a Pirate Captain and a slew of nautical symbols such as swords, treasure maps, and anchors. Although the graphics look pretty elementary, the game also includes Wild and Scatter Symbols along with jackpot wins. In addition, you have to option to play with Real Money or for fun, completely free. Truthfully, the Captains Treasure Slot Machine graphics look outdated and overly simple as though the game developers took the images straight from a coloring book. However, there remains a certain appeal to the game. The reels contain nautical images of anchors, treasure maps, and ship wheels. The Captain gives you a reassuring thumbs up if you land on a winning combination featuring his icon. On the reels you’ll find Wild Symbols which substitute for all other symbols even including the Scatter. A payout that includes the Wild Symbol doubles. 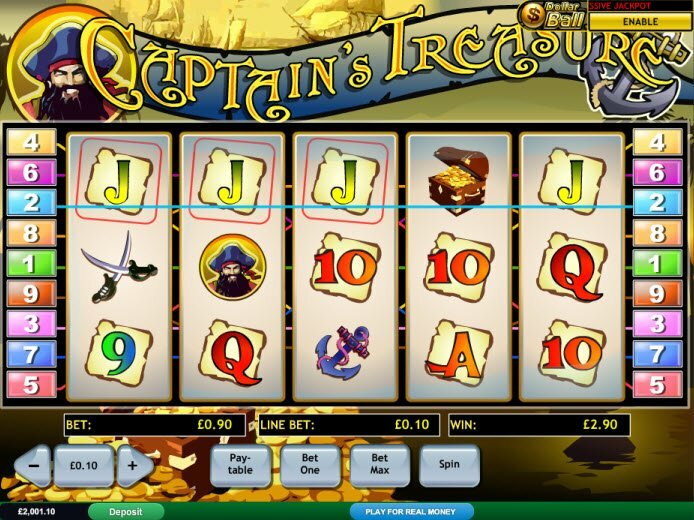 The Captains Treasure Slot game contains 5 reels and 9 paylines. On the reels you’ll find Wild Symbols which substitute for all other symbols even including the Scatter. A payout that includes the Wild Symbol doubles. The Scatter Symbol, represented by the treasure chest, awards multipliers from 1X up to 100X depending on the amount that appear on the reels. Naturally, the more Scatters that appear, the higher the multiplier. In addition, the Captains Treasure Slot jackpot awards 5000 coins along with a 2500 payout.